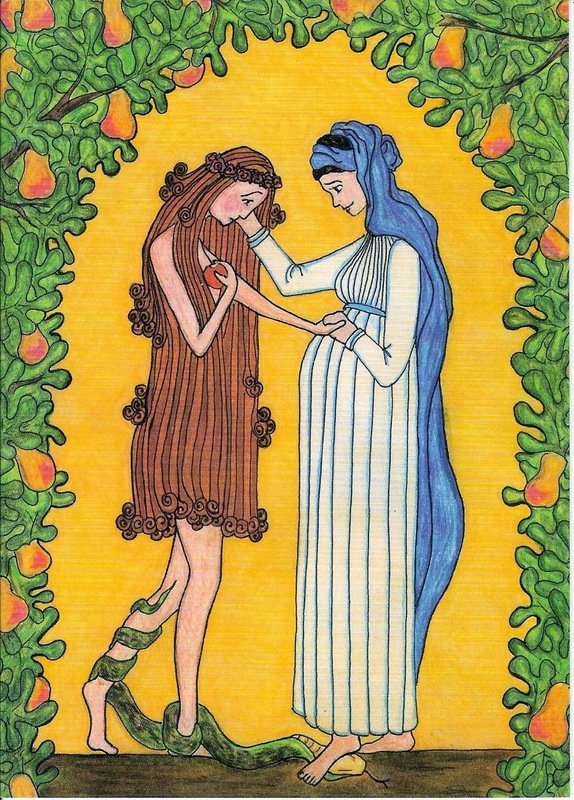 There is a beautiful image of Mary and Eve that I really love in which Mary is comforting Eve. The colors are vibrant and the message it conveys is a comfort to me. As Mary crushes the serpent that is wrapped around Eve’s leg, she holds Eve’s hand to her rounded belly, sharing with her the hope of redemption in Jesus Christ. Meanwhile, clothed in her own hair, Eve clutches a small, red apple to her chest. 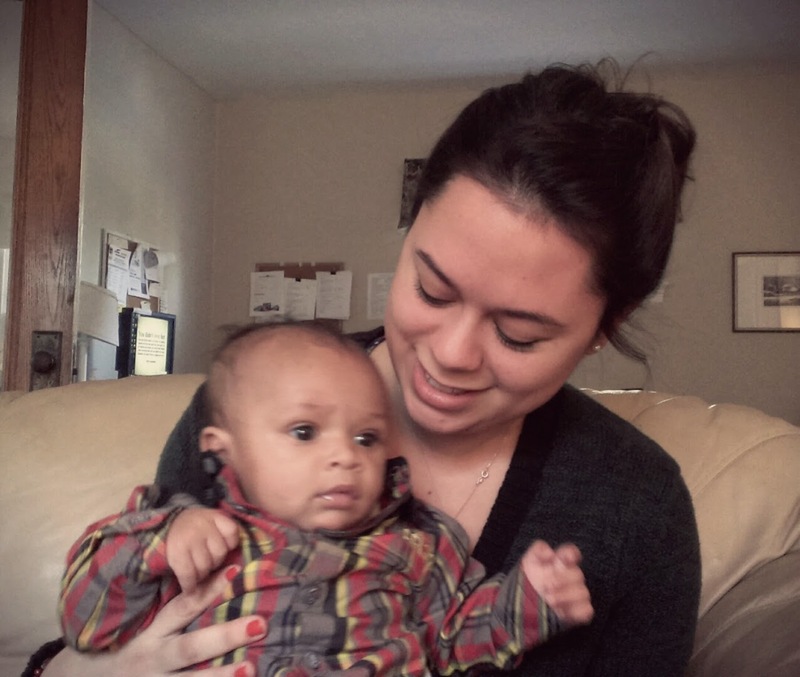 Two months ago, I came to Maggie’s Place – a home for pregnant and parenting women in need – with a mission to be like Mary, bringing comfort to the women I’d be serving along with a simple yet resounding message of love and hope. I thought I could be the Mary and they could be the Eve. I thought I would be the strong one, the one that rides in and casts the darkness from their lives with a sweep of my hand. I thought I could crush their serpents with my little foot. But when I’ve looked in the mirror these past two months, it is I who am consistently clutching that little red apple to my chest. In this story, the real story, our moms are the heroes, God is their strength, and I’m just along for the ride. My first contact mom at Maggie’s Place was one of the most beautiful women I had ever met. At 38, she was the oldest mom in the house and the grooves in her face told the story of a hard and sorrowful life. On that same face, her smile beamed joy at her newborn son whenever she held him. She was the living image of my definition of Maggie’s Place: a place where joy and sorrow go hand in hand. She was so motivated to leave her old destructive life behind and start fresh with her son, and I was going to do everything I could to help her. Together, we would change her life! In my head it was inevitable; it was basically a done deal. She would be a classic Maggie’s Place success story and her picture would flash across the Maggie’s Place website for years to come. Then one evening, just as things were looking promising for her, she didn’t come home. I waited and waited past curfew, staring down the front door, praying that she would walk in. Any minute now. Any minute. But she didn’t. And she never came home the next day, or the next. And she never answered her phone. I was angry and hurt for her. How could she do that? How could she just disappear from our lives without even a memo or a goodbye? It didn’t seem fair. I may never know the reason why she never came home that night and I could stay upset about it forever, or, I could let go of that apple that I was holding onto so tightly and trust that God was in control of the situation. I wanted so badly to love her the way I knew how, the way I thought was best, but God was asking me to love in a greater way. God was asking me to love with an open hand. Here at Maggie’s Place we get the chance to witness moments of great wonder and beauty, moments of deep sorrow and hurt, joy and cheer, fear and confusion, and we thank God for all of it. For whatever our sorrows, whatever our joys, whatever our current situation, we must trust that God is giving us our greatest chance for holiness. He is carrying every mother and her child down a winding, unique, and sometimes bumpy path and all we can do is walk alongside each other and live in that wonderment each day. God is asking us to let go of the apple and simply love with an open hand because it is then that we can truly witness the way he is giving us our greatest chance for holiness. Like the first time a mother invited me to feel her child kicking inside of her, Mary invites Eve to feel her Son. I can only extend my hand to that invitation if I have nothing clutched within it. I can only be a witness to God’s wonderful work in her life if I’m not clinging to my own agenda. He calls us to love with an open hand because no matter what our situation may look like, He is there to give us our greatest chance at holiness.